Nerd Block is a subscription mystery box that delivers geeky collectibles right to your door each month. You can choose whatever theme box you are into–there’s the Classic Block, Arcade Block, Sci-Fi Block, Horror Block, Comic Block, and even a Boys Jr. and Girls Jr. Block for younger kids. The sets always include a t-shirt, along with 4-6 other collectibles that are often exclusive to Nerd Block subscribers. I of course chose the Horror Block to try out for a six-month subscription to see what kind of goodies they had to offer. 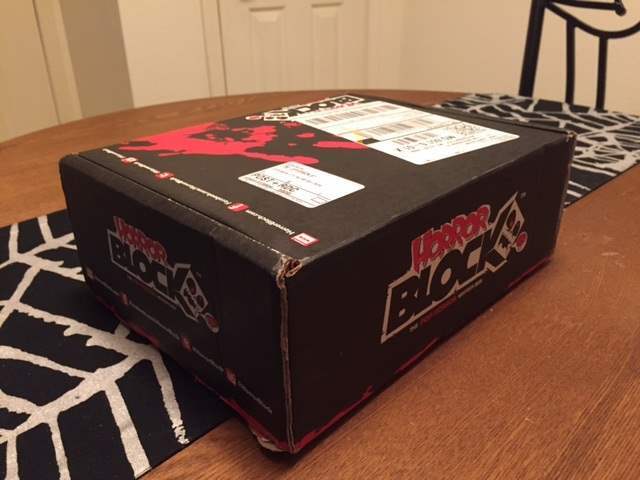 Today we are unboxing the December 2015 Horror Block. With the Horror Blocks set to ship right at Christmas in 2015 (they go out on the 25th of each month), the December Block took a little bit longer to get here, but it still made for a nice late Christmas present for myself. You never know what exactly is going to be in the box, though Nerd Block always gives hints as to the movie or TV show from which the items will be. 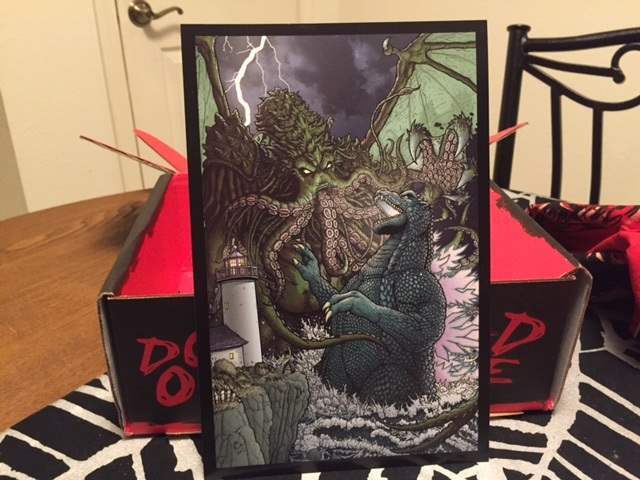 First up, we have a nice “Godzilla vs. Cthulhu” art print from artist Paul Hanley and it measures at 10.5″ x 7″. Neither Godzilla or Cthulhu is really my thing personally, but the print is beautiful and I like the artist’s style. 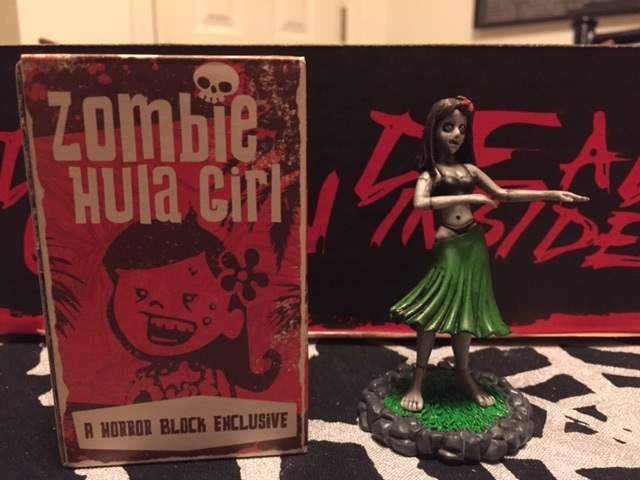 One of a couple Horror Block Exclusives this month included a Zombie Hula Girl dashboard ornament. She’s only about 3″ tall and while I don’t really see myself getting a lot of use out of this, she’s still cute and will help add a little bit of horror to my car, because why wouldn’t you want that? The other exclusive Block item this month is a keychain from Pop! Vinyl that features a little blood-splattered Daryl Dixon from The Walking Dead. I’m a keychain collector from way back, and those Pop! figures are pretty adorable, so I liked this addition. 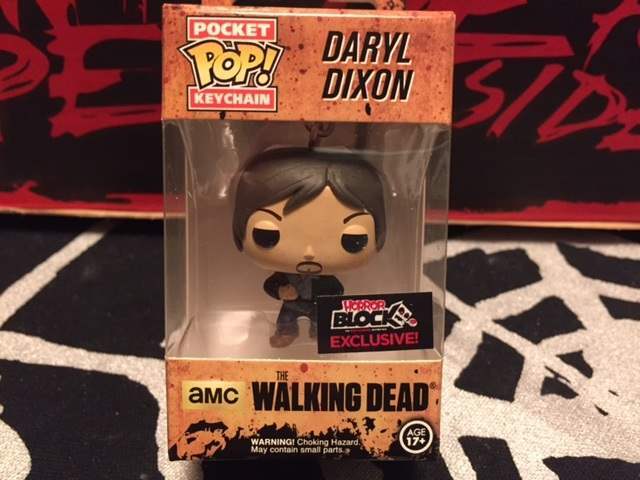 He’s the perfect keychain size, not too gaudy, and he’ll look nice on my keyring next to the Bates Motel and Overlook Hotel room number keychains that I already have. Okay, now we’re getting into the good stuff. 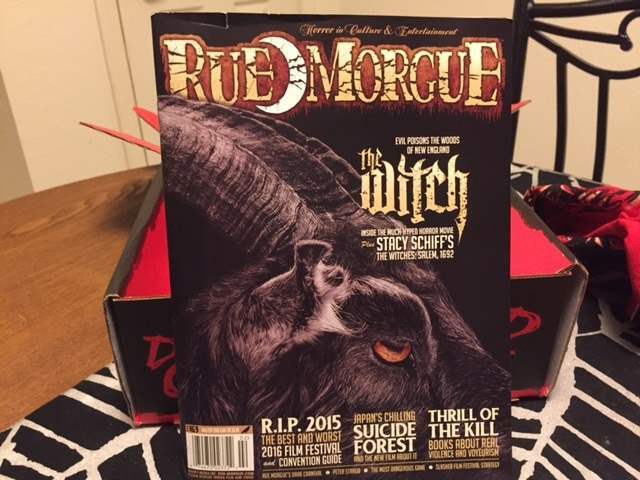 Like last month, Horror Block slipped into the December box the January/February 2016 issue of Rue Morgue magazine. It includes nice articles about new films like The Witch and The Forest, as well as Blu-Ray release news and reviews, and Rue Morgue‘s picks for the best and worst in horror in 2015. The magazine and the t-shirt alone usually make it worth the price of the box so I loved this. 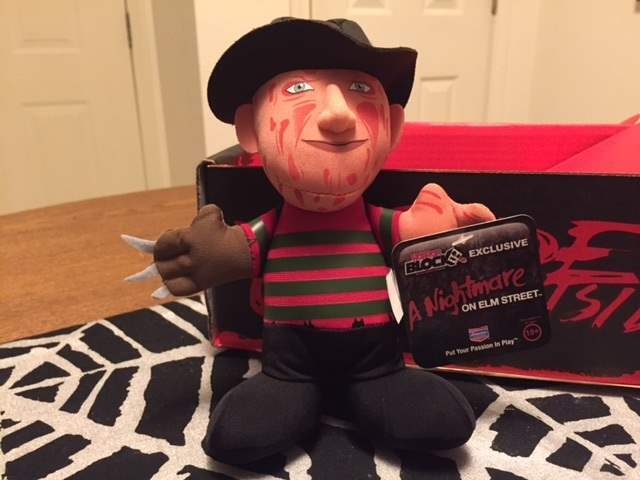 Nerd Block promised items that would pay tribute to the late Wes Craven (it still hurts to say that) and this was one of two items they sent to honor the great horror director. This is a 7″ plush figure of Freddy Krueger from A Nightmare on Elm Street, and though he looks a little too happy and is missing a finger and a claw, I still love this guy. I’ve already made a place for him on my nightstand so he can always look over me in my nightmares. Or possibly kill me. The crème de la crème of the box was the t-shirt, another wonderful tribute to Wes Craven. 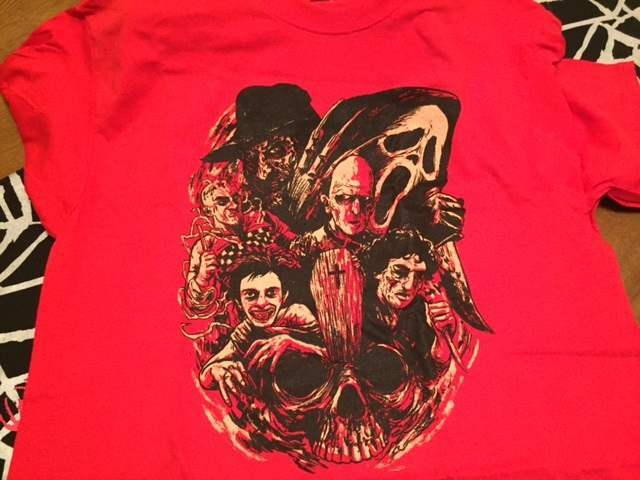 It comes courtesy of the t-shirt company ShirtPunch, and features characters from several of Craven’s most popular films, including A Nightmare on Elm Street, Scream, Shocker, The Hills Have Eyes, The People Under the Stairs, and The Last House on the Left. I have great love for all of these films and of course the man who created them, and to have them all together on a t-shirt–that I will no doubt be wearing all the time–is a great way to show that love. All in all, December’s Horror Block is a hit. With two homages to my favorite horror director, a beautiful magazine, an art print, and two cute collectibles, I enjoyed everything that I got and will continue looking forward to seeing what I get each month from Nerd Block. January’s box is set to include something from the original Carrie film, so already I know I’m going to love whatever that is! If you like what you saw here, head on over to Nerd Block to start your subscription today!